The Symphony Society presents concerts year round, primarily in communities from La Grange to Downers Grove, and on occasion in Naperville, Wheaton, Chicago, and on tour in the U.S. and abroad. 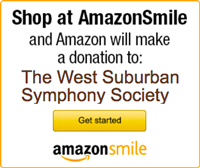 In 1947, the West Suburban Symphony Orchestra was founded by the West Suburban YMCA in La Grange Park, at the request of a dedicated group of local residents (see more below). In 1950, the orchestra transitioned to management by a not-for-profit fine arts organization. In 2003, the West Suburban Symphony Singers chorus was founded to facilitate performance of works for orchestra and symphonic chorus. In 2004, the West Suburban Symphony Chamber Orchestra was founded to perform music written for small ensembles. In 2008, the West Suburban Symphony Festival Orchestra was founded to perform during the summer, complementing the symphony and chamber groups, which perform during the academic year. Six music directors have served our organization: Karl Schulte (1947-1955), Irwin Fischer (1955-1977), Ralph Lane (1978-1988), James Winfield (1988-1996), James MacDonald (1997-2000), and Peter Lipari (2001 to present). As reported in the La Grange Citizen newspaper on March 8, 1972, our founders met in Western Springs in August 1947 to launch the orchestra: YMCA representatives Winifred Colton and Charles Stotz and area residents Clarence Dissinger, Edwin Goerges, Mr & Mrs. Frank Howell, Earl Rieger, Everett Shaw, and Mr. & Mrs. Duncan Wiedemann. The Wiedemanns hosted the organizational meeting at their home on Woodland Avenue in Western Springs. The first president of the orchestra's board of directors was William E. Stiegelmeier. Other members were Mary Fieg, Karl Heim, Kenneth McCracken, Clarence Peebles, and Gwendolyn Roberts. A partial list of charter members of the orchestra, assembled in the 1970s, includes violinists Eugene Heeter, Lorraine Landefeld, Max Pointel, Margaret Thompson, and Edward VanCura; violist Roger Uyttebruck; bassist John Alden; flutist Edwin Goerges; clarinetists William Kierig and Jean Quick Piper; trombonist Charles Stotz; bassoonist Raymond Novy; and percussionist Earl Rieger. Founder Dissinger, an influential musical leader and educator in the La Grange area, merits special mention. He graduated from North Central College in Naperville in 1921 and served as music director at Lyons Township High School in La Grange from 1924 to 1959; he died in 1969. The Clarence Dissinger Memorial Award for teaching, endowed by his family, is awarded annually to exceptional North Central College faculty members. Old newspaper clippings in our archives show that Dissinger also served as music director of a "West Suburban Symphony Orchestra" that began rehearsing in October 1930 and gave its first concert at his high school on April 12, 1931. As of September 1932, the group had 80 musicians, had performed two concerts in the 1931-32 season, and was planning an expanded concert series in 1932-33. We have no later records on this group, which apparently dissolved, perhaps under the strains of the Great Depression and World War II.